(AP) — Hawaii on Friday appointed a retired Navy captain to lead an overhaul of the state Emergency Management Agency two months after an employee mistakenly sent an alert warning of a ballistic missile attack. Thomas Travis has commanded a submarine squadron and was deputy commander of an aircraft carrier strike group. Travis served as the studies director of the Joint Center for Operational Analysis where he helped prepare a report on the federal government’s response to Hurricane Katrina. The false missile alert sent to cellphones and airwaves in January triggered widespread panic and led to the ouster of the agency’s senior leadership. 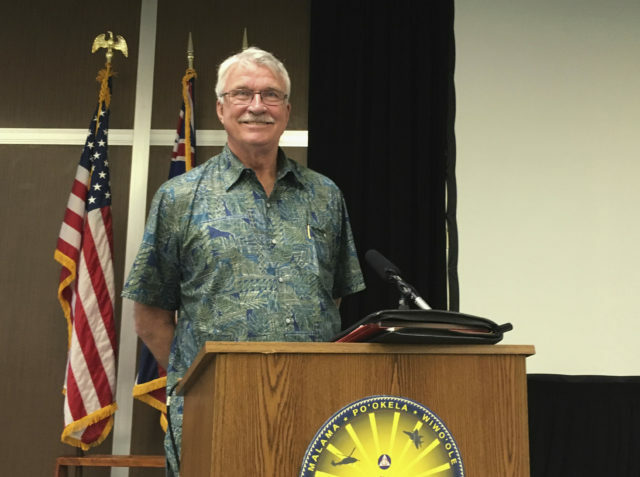 Thomas Travis at a news conference in Honolulu on Friday after the announcement of his appointment as chief of the state Emergency Management Agency. Travis declined to comment on what went wrong with the missile alert, telling reporters he has read the reports on the incident but hasn’t investigated the issue himself. He declined to comment on whether the federal government, as U.S. Sen. Brian Schatz of Hawaii has suggested, should be in charge of sending warnings about ballistic missile attacks. Travis has some personal experience with disasters in Hawaii: he spoke of living through Tropical Storm Iselle, which toppled trees and knocked out power in the Big Island’s Puna district in 2014. Travis was living in Kapoho at the time. He shared memories of using a chain saw to cut trees and clear roads. He said he didn’t lose power because he and his wife lived off the grid with solar panels and batteries. “I really have always loved Hawaii. It’s given a lot to me and I hope to be able to give back,” Travis said when asked why he took the job. The agency’s previous director, Vern Miyagi, resigned after the alert mishap. The employee who sent the alert was fired. A second worker quit before disciplinary action was taken, and another was suspended without pay. The agency said the alert was sent during a routine exercise. But the employee who sent the alert said he didn’t hear the word “exercise” being spoken and he believed the threat was real.